These animal figurines are made by village potters, who mold the clay by hand, fire and are often sold. They may be seen decaying at roadside shrines, where they are offered by travellers under the shade of trees. They also make inexpensive but attractive toys for children. Our Minimum Order of Quantity is 1000 pieces...!!! We are offering premium Terracotta Products for the nationwide customers. We offer a wide collection of Terracotta Products such as Terracota Horse, Terracotta Ganesh, Terracotta Utensils, Terracotta Wall Hangings, etc. Terracotta Products, provided by us, are available in creative designs. Therefore, our Terracotta Products are widely demanded throughout the market. - Bottles: 3" Diameter, 10" & 12" Height. 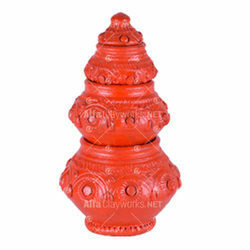 terracotta statue are available with us. GET THIS TYPE OF STATUE WITH 6'' TO 6 FT. IN HIGHT. Terracotta is burned clay art glazed or non glazed. 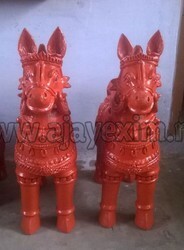 Terracotta horses & elephants & other decorative items size 6 inch to 48 inch starting price Rs 100 and vary as per size and design. Terracotta is a form of hard-baked pottery widely used in the decorative arts, especially as an architectural material. We have a large collection of terracotta wall hangings, flower vases, god idols, wall decor etc. made by our talented artists to suit your tastes. It comes in natural Red-Brown color. We also paint it as per our customer needs and requirements.